I first fell in love with the movies of Akira Kurosawa when I was a kid. Both my father and I really liked the action-packed masterpieces of Japan's best-known director and little did we know that his minimalist samurai sagas would be the artistic precursors of the martial arts films of today. I fell in love with Laurel Lukaszewski’s work when I first discovered it in one of the past Artomatic free-for-all mega art shows in Washington, DC. Back then, I picked her work as the key find of that particular Artomatic, and then I sat back in self-righteous pleasure as I saw Lukaszewski continue to grow as an artist and artistic force around the DC region. Back then I had no idea that Kurosawa and Lukaszewski would one day share a moment in my mind's eye and live together forever in this review. In the past I have also pointed to Lukaszewski as one of the District's artistic powerhouses that are dragging clay and other "crafty" substrates away from the craft world and into the rarified upper artmosphere of the blue chip fine arts world. I call them the Steiglitzes of the other side of the art tracks, dragging their media away from the craft and unto the fine arts arena. For a couple of years after that Artomatic, in the DC region we all marveled at Lukaszewski’s spectacularly complex interwoven forms, which managed to take the visual sense of the Byzantine into a minimalist context – that’s an almost illogical bridge which would ruin most Vulcan minds. But the sheer sharpness of this artist’s prowess did exactly that: she delivered these complex, tubular (not in the Californian sense) forms that interlocked in gorgeous wall hanging mazes that pulled us with a new found magnetic attraction to the media of clay. “There is magic in them works,” someone wearing a Caterpillar ball cap and chewing on a chunk of grass might say, and that magic served Lukaszewski well as it pulled us very close to her work to examine how impossibly complex and how cleverly minimalist they were at the same time. And now for the exhibition at Project 4. And that is what artists, real fire-in-the-gut artists, are supposed to do. And the fire that burns in Laurel Lukaszewski’s belly really came to a high roar in this exhibition at Project 4 gallery on U Street, NW in DC. And to say that I was left reeling from seeing what a huge new artistic footprint this artist has made in one show would be the understatement of the year. 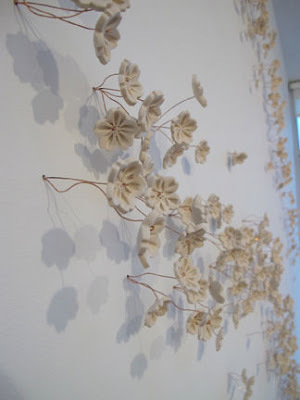 There are only four pieces in the show: Sakura (a sculptural cherry blossom installation); Pause (a hanging ribbon installation); Ghost (sculptural leaves); and Floridan (an outdoor floor piece). I’m going to take a chance and write about only one of them, because that one piece describes the new impression that the artist has left on me. In Sakura, the two-level gallery is used to showcase hundreds of small cherry blossom sculptures, each one individually pinned to the wall, to float and rise up from the main level, like a wave of starlings, from floor to floor. On the edges of the walls where the blossoms grow from, the floor is covered in delicate lost petals. Sakura is Japanese for cherry blossom. Each individual cherry blossom is a gorgeous example of a master sculptor at work - hundreds of them, floating up in a swirl of shadow-casting flowers is something else more akin to an Akira Kurosawa film come to life in a minimalist dream (for all you Kurosawa fans, I am referring to Sanjuro, specifically the part of the film where the camellia flowers in bloom are cut from the tree and dropped by the hundreds in the river to float down stream, as the signal for attack). 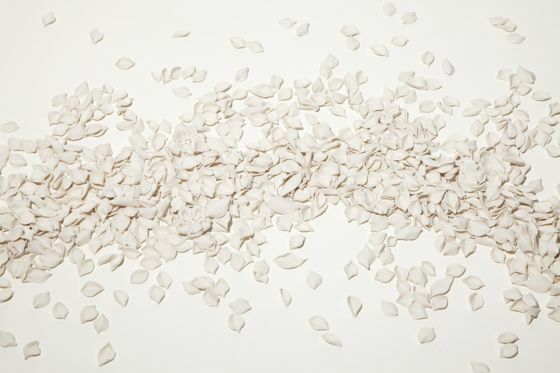 In this piece the artist bridges a paradox: minimalism is less – and she accomplishes that in the art form. And yet, her minimalism requires, no… demands - an entire “home” as its home. 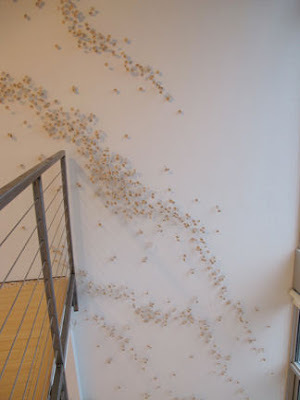 This gorgeous and enormous piece is a re-arrangeable work of art that can be set and re-set and re…ahhh… reset in many shapes, each one of which will yield new results, but the “less” part of minimalism in this case needs and covets more and more of the wall that it requires to anchor itself to. I submit that Sakura is such a spectacular work of art that when a collector purchases it, and I hope that a savvy one will soon, the only way that it should be showcased would be as the only work of art in that room, home, condo, house or setting. Anything else hanging on those walls around Sakura would diminish the artistic power punch to the solar plexus that Sakura delivers. It is the triumph of minimalism over space. And it is the triumph of a courageous artist not afraid to flex her own artistic muscles.